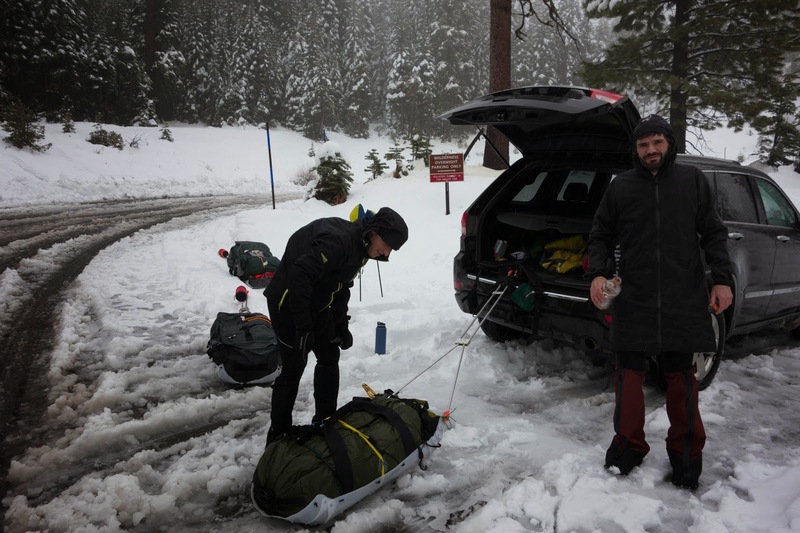 An atmospheric river flowed into northern California with much-welcome precipitation, and finally some snow in the Sierras. Badger Pass in Yosemite National Park received a foot of new powder over bare ground. We've been waiting for quick-access snow for weeks now, so Beat, Steve, and I made plans for an sub-24-hour overnighter to Glacier Point. Forecasts predicted heavy precipitation with a freezing level at about 6,000 feet, which was iffy, but I remained optimistic. "It could be warm and wet in Alaska, too. We already got some good cold-weather training in Fairbanks, and this will give us the other end of the spectrum." Of course, I expected (hoped for) nuking snow, but when we arrived at the ski hut in the late afternoon, it was raining. And not just a misty drizzle — it was raining hard, like a tropical downpour. Temperatures hovered in the mid-30s but the new and mostly unconsolidated snowpack was already fading fast. I made only light adjustments to my sled when I should have been wrapping the thing in a garbage bag, and insisted on not wearing shell pants because "When it's this wet, you're going to get wet. Everything's going to get wet. There's no escaping it." Onward we slogged, hoping the gradually climbing route would bring us to snow level. Steve and Beat pressed ahead into the gray sheets of rain as I ambled along in my snowshoes, lost in happy nostalgia about similar outings during my Juneau days. Ah, those were the days ... satin curtains of fog tumbling down the mountains, the duotone wash of green and gray, the slosh of slush underfoot, the incessant prattle of rain on a Gortex hood. Every mile or so, Beat and Steve would stop to wait for me and we'd all ask the inevitable question, "Are we actually planning on camping in this?" "I used to go camping all the time before I moved to Juneau," I told them, "And lost that habit there, sadly, but for good reason." One Juneau habit I remembered was wet layering. "My limit in weather like this is five to six hours before I start getting cold. Then I either have to change clothes, or add layers, until those too are wet. Yeah. In five years, I never figured out a better solution." After six miles in two and a half hours, we had climbed to 7,500 feet and the rain was only beginning to shift into thick snain — a sort of blended-drink mix of chunky slush and larger droplets of rain that somehow feels even wetter than plain rain. By then, we had decided that the only real Alaska training we were going to get here was an exercise in enduring extreme misery. We'd planned to spend upwards of twelve hours hanging out in camp — cooking, practicing snow-melting, and generally enjoying ourselves because the reason we do this stuff is mainly for fun. Steve discovered his down coat was drenched, and Beat and I had also saturated various pieces of gear that we failed to move inside of dry bags, including my only pair of warm mittens. So there wasn't a feasible way to stay comfortable outside while not moving, and twelve hours inside of a damp sleeping bag beneath a water-resistant bivy sack did not bode well for not getting up in the middle of the night for a hypothermic hike out. And although it was good to learn the weaknesses in our gear systems, we had no need to practice camping in a deluge. If it really ever rained this hard in Alaska, we would not stop moving until we reached shelter, not unless we were in dire straits. It's one of those weather conditions in which it is nearly always more difficult and dangerous to stop than it is to keep moving. We turned around, and were back in Mariposa for Mexican food and live music by 9 p.m. Ah, that's better. Steve recently returned from racing the Arrowhead 135 in Minnesota, one of the coldest years yet for that race. He commented, "I'd take 30 below over this any day." I think Juneau Jill would agree. As for current Jill, I'm torn. Both conditions are very difficult, but 35 above, even when accompanied by much wetness, does contain a greater margin for error. 35 below demands the utmost vigilance to keep all systems working well, but at the same time it's easier to manage in terms of stability. Once you find a system that works for you, you don't have to change much about it over the long term. But if it rains and keeps raining, over time you either have to add more sacrificial layers over your saturated clothing, or move continuously faster. We're still bracing ourselves for difficult scenarios in Alaska. Right now, the Iditarod Dog Sled Race is considering moving the start of the race north to Fairbanks, then following the original serum run route over the Chena, Tenana, and Yukon Rivers. They're considering this because there's so little snow in the Dalzell Gorge that it may be impossible for them to build a trail at all (snow bridges are built to cover open leads in the creek), and there remains little to no snow cover in both the Susitna River Valley, and the other side of the range across the Farewell Burn. The last time the Iditarod Dog Sled Race moved north, in 2003, Alaska Ultrasport followed suit and held a 350-mile race from Fairbanks to Galena that was almost entirely on rivers. I lied awake last night stressing about this, because to be honest I am not terribly interested in walking 350 miles of wide-open river. The appeal of participating in this race on foot was to experience these well-remembered landscapes that I love in a new way. I love the variety of the Iditarod Trail, the chance to cross the Alaska Range, the sparse moonscapes and Christmas-card forests. I eventually arrived at the decision that if it's a serum run year, I would still like to participate in the short race, but I would do it on a bike. Then I realized that I don't have a proper set of boots, don't have adequately tested gear, don't have any experience with my new snow bike and too little bike training behind me this winter. As much as I'd love to bike either route, I am not prepared, not this year. Today, the ITI race organizers announced that trail conditions still look doable to start the human-powered race in Knik. But without the support of Iditarod trailbreakers, there would be fewer trail markings and likely no trail over Rainy Pass, save for what Bill and Rob could put in themselves. Still, this sounds like an adventure and I'd be much more excited about this possibility, especially as a participant on foot. There are likely to be lots of unique challenges if there's no significant snowfall between now and then — technical travel on ice that will necessitate more foot gear and likely exacerbate the already inevitable problem of hurty, hurty feet. Also likely are open water crossings that will have to be navigated while carrying a sled whether it's 30 above or 30 below, the latter necessitating utmost precaution. Long sled drags on dirt and tussocks will be more difficult than snow due to high friction and uneven terrain, and also threaten to break sleds and pound body parts. And, if the Dalzell Gorge proves impassable, a long detour around Hell's Gate would add 40 miles — an entire day — to the trek, through an area that is notorious for glare ice and overflow. If I am caught in rain, I will camp in it, but I fear seven years as a wilderness kayak ranger in Sitka has forever turned me to a fairweather camper. I think you made a good choice. I'm firmly against unneeded suffering...especially if there's good food involved in the alternative. Was Donner / Tahoe too stormy? Higher elevations reported 30" of pow. The draw of Yosemite was the recently groomed trail. It's hard to find current conditions reports on Tahoe snowmobile trails, and 30 inches of pow over old trails does not make for great sled-dragging conditions. Alas, mid-week would have been a great time to go, but that moist flow of air from the tropics meant even elevations of 8,000 feet were getting rained on by the weekend. From what I heard it was similarly wet at Squaw Valley on Saturday.